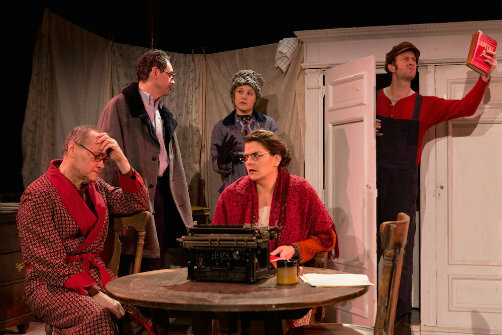 Edward Prostak, Brian J. Carter, Erin Biernard, Joshua R. Pyne and Jessica Levesque in Collaborators. Photo by Michael Abrams. BOTTOM LINE: The U.S. premiere of a play that questions the principles of the artist when threatened or seduced by an oppressive regime. With a cluttered set containing red curtains and red pillars that allow for a contrast with their majestic imposition, we are already halfway to Russia. The background soundtrack to our waiting finalizes our trip back to 1938 and prepares us for Soviet realness. Based on a true story, Collaborators tells the tale of an intellectual dissident playwright named Mikhail Bulgakov (Brian J. Carter) who is chosen by Joseph Stalin (Ross DeGraw) to write Young Joseph, a bio play in celebration of the Generalissimus' upcoming birthday. Imagining the details of said event through the lens of surrealism, playwright John Hodge accomplishes a vivid account, as well as manages to create an interesting movement between the absurd and witty moments of Stalin's and Bulgakov's meetings and the tragic reality that completes the play. The humor seems to slip out of purpose here and there, but nothing that harms the integrity of storytelling. Sown to that are extra commentaries about the creative process of writing a play and its tough path towards production. Such commentaries prove to be a delight for those intimately familiar with such truths. With that in mind, the play, told in two acts, uses the veridical premise to question how well an artist's principles are rooted in situations of high stakes in which physical, emotional and psychological integrity are at risk. But here the stakes didn't seem high at all to begin with, making Bulgakov's change of heart devoid of value. The turning point—the threatening of Bulgakov's wife Yelena (Erin Biernard)—happens all to quickly, leaving us little to no time to feel his anguish. From that point on, both his physical and economical situation improve and so does that of those he loves. A mild counterpoint to his flimsy character and economic rise is presented through Grigory (Maury Miller), a dissident writer, friend and admirer of Bulgakov's. Somewhat overshadowed by the meetings between Stalin and the playwright, this gesture of dramatic counterpointing doesn't seem to live up to its full potential. There is of course great comfort in the scenes between those two. As the dictator and the playwright switch roles, an important question rises concerning the structure of both creative and governing processes and how the decision making in one leaves far less damaging consequences than the other. Going beyond that, it also shows that when given the proper tools and distance, characters of flesh and blood can be seen as characters of word and paper. The resolutions make the play rise in act one, but drag somewhat in act two. Director Peter Dobbin's use of space is both commendable and tiring, creating an interesting dynamism that infuses the first act with life. We see an over crowded apartment turn into a secret room underneath the Kremlin, a hallway turn into a doctor's office and an empty space turn into a stage for the performance and rehearsal of the plays written by Bulgakov (and Stalin). But because the dynamic remains somewhat the same, it demands quite a lot from our attention while deterring us from the delicious spectacle of acting that goes on in front of us. Be it between Stalin and Bulgakov, a most beloved pair of the evening, or between Bulgakov and Vladimir (Robin Haynes), much of the actors' work seemed rushed at times because of the aforementioned dynamic. DeGraw's large, deceivingly warm and manipulative rendition of Stalin is a treat. Carter is a thespian tailor on stage with his elegant portrayal of Bulgakov. Haynes' presentation of the arresting officer/producer/director of Young Joseph borders on genius, even if the complexity of the character isn't always carried through. Bulgakov's living companions Vasily (Edward Prostak), Praskovya (Jessica Levesque), Stepan (Joseph Salvatore Knipper) as well as his doctor (Michael Bernosky) and Young Josef (Sean Cleary) all make up for a fine and sharp ensemble. Props go to Levesque for her manipulation of voice timbre and nuanced expressions to punctuate the text's rich comedic and tragic undertones and for Cleary's ear for accents and balanced and effective portrayal of melodramatic Young Josef. All in all, Collaborators is an entertaining play that balances wit and criticism as it gives us a privileged seat to the revelation of how principled a dissident voice can really be and how the integrity of the mind, when broken, puts all else in jeopardy. Collaborators is written by John Hodge and directed by Peter Dobbins. Scenic design is by Rebecca Grazi. Costume design is by Courtney Irizarry. Lighting design is by Michael Abrams. Sound design is by Joel Abbott. Production stage manager is Charles Casano. Assistant director is Fleur Alys Dobbins. Technical director is Duane Pagano. Graphic design is by Michelle O'Gara. The show features Brian J. Carter, Ross DeGraw, Erin Biernard, Edward Prostak, Jessica Levesque, Joshua R. Pyne, Michael Bernosky, Robin Haynes, Joseph Salvatore Knipper, Natalie Pavalek, Maury Miller and Sean Cleary.